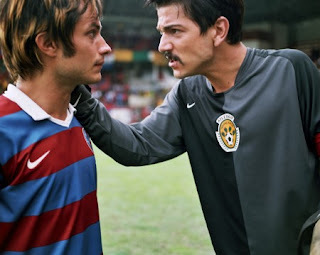 At Sundance, North American audiences got to see the reteaming of “Y Tu Mama Tambien” stars Diego Luna and Gael Garcia Bernal once again in “Rudo Y Cursi”. While they're not Bogie and Bacall, 'Y Tu Mama Tambien" gave each actor enough publicity and accolades to grow and develop with bigger and bigger roles. Now eight years later they have reteamed with their “Tambien” co-writer Carlos Cuaron. “Rudo Y Cursi” is one the highest grossing films in Mexico right now. This brings up the question. What other creative reunions of cinema would we like to see? Danny Boyle’s first three films starred Ewan McGregor (including the massive hit “Trainspotting”). But when Leonardo Di Caprio trumped McGregor’s casting in “The Beach” it produced a rift in their working relationship that hasn’t been mended. The careers of both men have grown enormously and it’s time we saw them bury the hatchet and work together again. Of course, De Niro was Scorsese’s go-to actor for 20+ years. They made 8 films together – 3 in the 70’s, 2 in the 8o’s and 3 in the 90’s. The last film we saw them together was 1995’s “Casino”, that’s over 13 years ago. De Niro was almost cast as Queenan in “The Departed”, but opted to direct “The Good Shepherd” instead. While there’s no broken relationship here we desperately need a new De Niro/Scorsese movie before these guys get too old. In the 80’s Tim Burton’s alter-ego was Michael Keaton. They made three films together, “Beetlejuice”, “Batman” and “Batman Returns”. Since then its only been Johnny Depp. Burton didn’t even find a cameo for Keaton in “Mars Attacks”! What gives? One the most influential collaborations behind the camera are the great films of Oliver Stone shot by DOP Robert Richardson. From Salvador to Platoon to Born on the Fourth of July to JFK to Nixon, Richardson with Stone created an ever evolving body of highly creative work. Their last film together was the abominable “U-Turn”. Perhaps this experience spoiled their creative relationship. According to the IMDB they are working together on “Pinkville”, but who knows if that will come to fruition. In the early 80’s Sam Raimi hired Joel Coen as an assistant editor for “The Evil Dead”. Though their working relationship resulted in only two more collaborations, Sam Raimi’s 1985 comedy “Crimewave” (co¬-written by the Coen Bros) and the Coens’ “Hudsucker Proxy” (co-written by Raimi) they still share a kinship is their distinct visual humour. Since the careers of all three filmmakers have exploded since the 80's, surely it wouldn’t take much to greenlight a “Raimi/Coen Bros” production? A reteaming of the gunplay masters John Woo and Chow Yun-Fat almost happened with John Woo’s period epic “Red Cliff”. The actor was cast but dropped out after production started, his co-star in “Hard Boiled” Tony Leung took his place, but the film never found a theatrical release in the U.S. In any case, 'Red Cliff" wasn't the traditional Hong Kong gunplay film we'd want see the two make again. Just one more double-gun slo-mo blood ballet please? While a Coen Bros/Sam Raimi reunion may be far-fetched we badly need to see Sam Raimi cast Bruce Campbell in a leading role again. Of course we saw Campbell in cameo roles in each of the Spider-man films but a lead role is badly needed. Whether or not it’s “Evil Dead 4”. Raimi needs to slow some more love to “The Chin”. Peter Jackson’s “Heavenly Creatures” introduced to the world Kate Winslet, a marvelous performance as the crazed psychopathic teenager Juliet Hume. Next to Winslet’s performance is Melanie Lynskey’s less glamourous but equally stunning portrayal of Pauline Parker. Multiple Oscar noms later Kate Winslet is one of the most sought after actresses in the world. Quietly Melanie Lynskey has had an ever growing career. Lay audiences would know her most from TV’s “Two and a Half Men”, but also fine supporting roles in “Sweet Home Alabama”, “Flags of Our Fathers” and “Shattered Glass”. A key role in Steven Soderbergh’s upcoming “The Informant” might push her more into the public consciousness. Not “True Lies 2” and not another “Terminator” film. A cameo in “Avator” please? Remember Hopper’s mesmerizing and career-saving performance as the crazed oxygen-mask-wearing foul-mouthed Frank Booth in “Blue Velvet”? Come David, get Dennis on the horn. Like the Stone/Richardson relationship DOP Gordon Willis’ work with Woody Allen was magical (“Annie Hall”, “Manhattan”, “Purple Rose of Cairo”). Problem is Willis hasn’t worked on a feature since 1997. Throw in Diane Keaton and its marketing gold! Both are still alive. One last kick at the can, perhaps with Jean-Paul Belmondo, could produce another “Ginger and Fred” - Fellini's 80's reunion film with Giulietta Masina and Marcello Mastroianni? One great film together is not enough for these two. PT likes to keep his family together. Why not Mark Wahlberg? i love Stone/Richardson; no coincidence Stone's output since Richardson left has been far below par (at least U-Turn was visually fun to watch). i also can't help but think Richardson never would have allowed the awful uniform design in "Any Given Sunday". pretty much ruined for me any credibility than movie could have had. I've been waiting for another Burton/Keaton movie since 1992. This was a fun article so Thank-you! But I have to say: an Arnold Schwarzenegger cameo in Avatar? Cameron denied his friend Michael Beihn a roll in Avatar as he felt the whole thing would then feel like an Aliens renunion. I think and Aliens renunion sounds like an awesome idea but I see his point: It would distract from the story. An Arnold Schwarzenegger would bring the story to a screaming halt. Sam Rami/ Bruce Cambell: I would watch anything and everything with Bruce "Don't call me Ash" Cambell. Army of Darkness is by far one of my all time favs. Paul Thomas Anderson may reunite with Wahlberg to do a biopic Gianni" Russo, who played Carlo in "The Godfather," and reportedly acted as an intermediary between Paramount Studios and NYC Mafia don Joe Colombo Sr. in order to get the film made. I actually think the more exciting De Niro reunion would be with Harvey Keitel. It would serve both of them well. Another one that's missing is Barry Sonnenfeld/Coen Bros. I mean Roger Deakins is amazing, but Sonnenfeld really did some great work with them as a DP (and it would probably help his career too). It is Ewan, not Ewen.